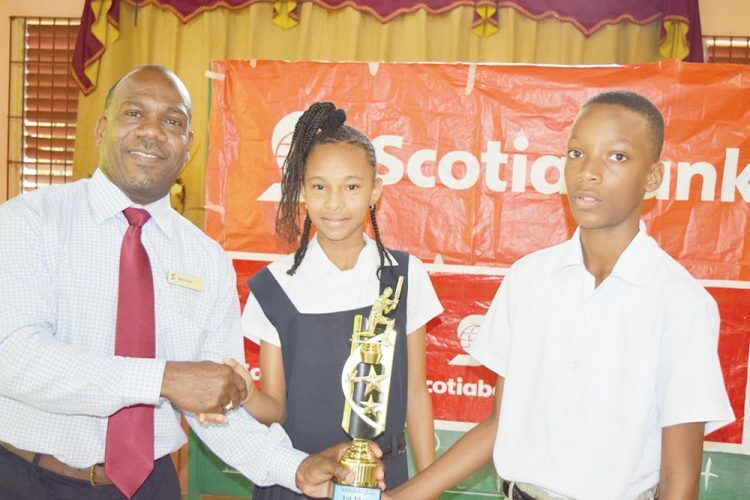 After copping the first ever Scotia Bank Kiddy Cricket Quiz in 2011, the Richland Park Government School returned to the top at the 2017 edition, held last Thursday, at the Red Cross Headquarters in Kingstown. The duo of Synelila Shoy and Daquan Lynch with 96 points, helped their institution outdo the other four finalists that showed up. Shoy was also adjudged the best female quizzer and Lynch, the best male quizzer. Second, with 84 points, was the Pamelus Burke Primary, represented by Annesly Roban Jr and Reynolly Hillocks, while the Paradise Primary of Bequia, represented by Zane King and Orette Ollivierre, was third. Paradise Primary recorded 80 points. The two other schools which participated in the finals were the Questelles Government and the Langley Park Primary. The Langley Park Primaryâs Philroy Connor was adjudged the most outstanding teacher. Last Thursdayâs final was intended for 10 finalists, which emerged from the zones; however, five did not contest the title. Those absent from the finals were the Chateaubelair Methodist, Layou Government, Calliaqua Anglican, Argyle Primary and 2016 winners St Maryâs Roman Catholic. The quiz was made up of a written multi-choice, oral open-ended questions and an oral Mathematics segment.